Wonderwerk Cave is an archaeological site, formed originally as an ancient solution cavity in dolomite rocks of the Kuruman Hills, situated between Danielskuil and Kuruman in the Northern Cape Province, South Africa. It is a National Heritage Site, managed as a satellite of the McGregor Museum in Kimberley. Geologically, hillside erosion exposed the northern end of the cavity, which extends horizontally for about 140 m (460 ft) into the base of a hill. Accumulated deposits inside the cave, up to 7 m (23 ft) in depth, reflect natural sedimentation processes such as water and wind deposition as well as the activities of animals, birds and human ancestors over a period of some 2 million years. The site has been studied and excavated by archaeologists since the 1940s and research here generates important insights into human history in the subcontinent of Southern Africa. Evidence within Wonderwerk cave has been called the oldest controlled fire. Wonderwerk means “miracle” in the Afrikaans language. The cave contains up to 6 m (20 ft) depth of archaeological deposits reflecting human and environmental history through the Earlier, Middle and Later Stone Ages to the present. Cosmogenic dating suggests that basal sediment entered the cave some 2 million years ago. Rock art occurs in the form of parietal paintings within the first 40 m (130 ft) from the entrance, possibly all less than 1000 years old, and small engraved stones found within the deposit, mainly from the Later Stone Age sequence where they date back some 10,500 years. The associations of older engraved or striated pieces have yet to be substantiated. Major damage was caused in the 1940s when local farmers dug up large parts of the cave interior to bag and sell organic-rich material as fertiliser – which in fact comprised stratified archaeological deposits containing artefacts, bone and other material that would have been crucial to an understanding of the cultural and palaeoenvironmental history of the site. The presence of bone was reported upon, leading to the first archaeological and zooarchaeological investigations. The sediments within the cave exhibit exceptional preservation of organic remains including macro-botanical remains, phytoliths and micro and macro-fauna which shed light inter alia on species extinctions relative to the end of the last ice age circa 10 000 years ago – studied by Francis Thackeray. Margaret Avery and Yolanda Fernandez-Jalvo are studying the small mammal remains introduced to the cave sediments as part of the contents of owl droppings and which provide indications as to the palaeenvironmental conditions outside the cave. Also preserved are pollen, another key source of information on changing environmental conditions outside the cave, currently studied by Louis Scott but initially examined by E.M. van Zinderen Bakker. Lloyd Rossouw is researching phytoliths from the cave, which show changing vegetation profiles, while preserved charcoal is being studied by Marion Bamford to generate data on woody plants. Indications of the cave’s contemporary social or ritual significance relate inter alia to the occasional collecting of water, by local African people, for healing purposes. There are other nearby sites where beliefs concerning the ritual power of water (associations with a mythic watersnake are remarked upon), for example by members of the Zion Christian Church, include the Kuruman Eye and Boesmanspit. The past ritual significance of the site is subject to on-going archaeological investigation. The rock art on the walls of the cave near its entrance, being researched by David Morris  and engraved stones found in the deposit may implicate changing ritual significance. Aspects of the use of the cave's deep interior reaches are also being considered in these terms. Chazan and Horwitz refer, as Beaumont had done, to the introduction of manuports (unmodified natural stones) "with special sensory properties" by terminal Acheulean hominins, more than 180,000 years ago, to the deep interior of the cave which is characterized by "singular acoustic and visual qualities." They argue that the site provides a "unique and extensive diachronic record of milestones in the development of symbolic behaviour" and "evidence to support the position that elements of symbolic behaviour emerged long before the dispersal of modern humans out of Africa." Julia Martin devotes a chapter to Wonderwerk Cave in her book A Millimetre of Dust, the title of which was inspired by a remark about the site. Michael Cope's anthology Ghaap has sonnets inspired by Wonderwerk Cave. Wonderwerk Cave, within a servitude ceded to the McGregor Museum, was declared a National Monument of South Africa in 1993. It was opened to the public, as a site museum, in 1993. In the same year a major graffiti-removal project was carried out. In 2000 new legislation made the site a Provincial Heritage Site. Between 2003 and 2009 it was assessed in terms of the grading system prescribed by the National Heritage Resources Act and graded as a Grade I site (i.e. : of national significance). Declaration as a National Heritage Site followed, being published in the Government Gazette on 12 March 2010. Coupled in a serial nomination with Border Cave and Klasies River Mouth for South Africa's Tentative List for World Heritage inscription, it was re-nominated in its own right for the Tentative List in April 2009. Wonderwerk Cave was one of the 100 sites selected for the 2010 World Monuments Watch by the World Monuments Fund. ^ "Home |Wonderwerk". www.wonderwerkcave.com. Retrieved 31 May 2016. ^ Beaumont, P.B., & Vogel, J.C. 2006. On a timescale for the past million years of human history in central South Africa. South African Journal of Science 102:217–228; Chazan, M., Ron, H., Matmon, A., Porat, N., Goldberg, P., Yates, R., Avery, M., Sumner, A., & Horwitz, L.K. 2008. Radiometric dating of the Earlier Stone Age sequence in Excavation I at Wonderwerk Cave, South Africa: preliminary results. Journal of Human Evolution 55:1–11. ^ Chazan, M., Ron, H., Matmon, A., Porat, N., Goldberg, P., Yates, R., Avery, M., Sumner, A., & Horwitz, L.K. 2008. Radiometric dating of the Earlier Stone Age sequence in Excavation I at Wonderwerk Cave, South Africa: preliminary results. Journal of Human Evolution 55:1–11. ^ a b Thackeray, A.I., Thackeray, J.F., Beaumont, P.B. & Vogel, J.C. 1981. Dated rock engravings from Wonderwerk Cave, South Africa. Science 214, 64–67. ^ Malan, B.D. & Cooke, H.B.S. 1941. A preliminary account of the Wonderwerk Cave, Kuruman district. South African Journal of Science 37, 300–312; Malan, B.D. & Wells, L.H. 1943. A further report on the Wonderwerk Cave, Kuruman. South African Journal of Science 40, 258–270. ^ Butzer, K.W., Stuckenrath, R. & Vogel, J.C. 1979. The geo-archeological sequence of Wonderwerk Cave, South Africa. Abstract of paper presented to the Society of Africanist Archaeologists in America, Calgary, April 1979; Butzer, K.W. 1984. Archeogeology and Quaternary environment in the interior of Southern Africa. In: Klein, R.G. (ed.). Southern African prehistory and paleoenvironments, 1–64. Rotterdam: A.A. Balkema. ^ Beaumont, P. 1990. Wonderwerk Cave. In Beaumont, P. & Morris, D. (eds.). Guide to archaeological sites in the Northern Cape, 101–134. Kimberley: McGregor Museum; Beaumont, P.B., & Vogel, J.C. 2006. On a timescale for the past million years of human history in central South Africa. South African Journal of Science 102:217–228; Beaumont, P.B. & Vogel, J.C. 2008. Discovering the deep African past at Wonderwerk Cave. Quest 4(3):3–7; Binneman, J. & Beaumont, P. 1992. Use-wear analysis of two Acheulean handaxes from Wonderwerk Cave, Northern Cape. Southern African Field Archaeology 1, 92–97; Mercier, N., Valladas, H. & Valladas, G. 1995. Flint thermoluminescence dates from the CFR Laboratory at GIF: Contributions to the study of the chronology of the Middle Palaeolithic. Quaternary Science Reviews 14, 351–364. ^ Humphreys, A.J.B. & Thackeray, A.I. 1983. Ghaap and Gariep. Late Stone Age studies in the Northern Cape. Cape Town: South African Archaeological Society Monograph Series No.2. ^ Chazan, M., Ron, H., Matmon, A., Porat, N., Goldberg, P., Yates, R., Avery, M., Sumner, A., & Horwitz, L.K. 2008. Radiometric dating of the Earlier Stone Age sequence in Excavation I at Wonderwerk Cave, South Africa: preliminary results. Journal of Human Evolution 55:1–11; Rüther, H., Chazan, M., Schroeder, R., Neeser, R., Held, C., Walker, S.J., Matmon, A. & Kolska Horwitz, L. 2009. Laser scanning for conservation and research of African cultural heritage sites: the case study of Wonderwerk Cave, South Africa. Journal of Archaeological Science 36:1847–1856. ^ Rüther, H., Chazan, M., Schroeder, R., Neeser, R., Held, C., Walker, S.J., Matmon, A. & Kolska Horwitz, L. 2009. Laser scanning for conservation and research of African cultural heritage sites: the case study of Wonderwerk Cave, South Africa. Journal of Archaeological Science 36:1847–1856. ^ Ron H., Beaumont P., Chazan M., Porat N., Yates R. & Horwitz L.K. 2005 Evidence for Early Acheulian cave occupation revealed by the magnetostratigraphy of Wonderwerk Cave, Northern Cape. SASQUA XVI, 30th March-3rd April, Bloemfontein, South Africa. ^ a b Bamford, M. & Thackeray, F. 2009. Continued excavations at Wonderwerk Cave. The Digging Stick 26(2):21–22. ^ Avery, D.M. 1981. Holocene micro-mammalian faunas from the northern Cape Province, South Africa. South African Journal of Science 77, 265–273; Avery, D.M. 1995. Southern savannas and Pleistocene hominid adaptations: the micromammalian perspective. In: Vrba, E.S. ; Denton, S.H. ; Partridge, T.C. & Burckle, L.M. (eds.). Palaeoclimate and evolution with emphasis on human origins, 459–478. New Haven: Yale University Press;Fernandez-Jalvo Y.& Avery D.M. 2015. Pleistocene Micromammals and their Predators at Wonderwerk Cave, South Africa. African Archaeological Review 32:751–791. ^ Beaumont, P.B., van Zinderen Bakker, E.M. & Vogel, J.C. 1984. Environmental changes since 32 000 BP at Kathu Pan, northern Cape. In: Vogel, J.C. (ed.). Late Cainozoic palaeoclimates of the Southern Hemisphere, 329–338. Rotterdam: A.A. Balkema; Scott, L., Steenkamp, M. & Beaumont, P.B. 1995. Palaeoenvironmental conditions in South Africa at the Pleistocene-Holocene transition. Quaternary Science Reviews 14, 937–947; Scott L. & Thackeray J.F. 2015. Palynology of Holocene Deposits in Excavation 1 at Wonderwerk Cave, Northern Cape (South Africa.African Archaeological Review 32:839–855. ^ Bamford M.K. 2015.Macrobotanical Remains from Wonderwerk Cave (Excavation 1), Oldowan to Late Pleistocene (2 Ma to 14 ka BP), South Africa. African Archaeological Review 32:813–838. ^ Butzer, K.W. 1984. Archeology and Quaternary environment in the interior of Southern Africa. In: Klein, R.G. (ed.). 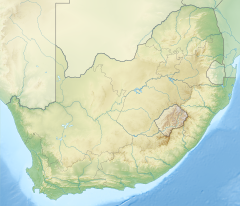 Southern African prehistory and paleoenvironments, 1–64. Rotterdam: A.A. Balkema. ^ Goldberg P., Berna F. &hazan M. 2015. Deposition and Diagenesis in the Earlier Stone Age of Wonderwerk Cave, Excavation 1, South Africa.African Archaeological Review 32:613–643. ^ a b Horwitz, Liora Kolska; Chazan, Michael (2015). "Past and Present at Wonderwerk Cave (Northern Cape Province, South Africa)". African Archaeological Review. 32 (4): 595–612. doi:10.1007/s10437-015-9208-5. ISSN 0263-0338. ^ Notice No 178, Government Gazette Vol 537, No 33006, 12 March 2010, pp 11–13. ^ World Monuments Fund (6 October 2009). "World Monuments Fund Announces 2010 World Monuments Watch List of 100 Most Endangered Sites" (PDF). World Monuments Fund. Retrieved 8 October 2009.